Product prices and availability are accurate as of 2019-04-11 21:56:07 EDT and are subject to change. Any price and availability information displayed on http://www.amazon.com/ at the time of purchase will apply to the purchase of this product. This cooling system has two high-quality, low-noise 80mm fans, with long-lasting and quiet Fluid Dynamic bearings. It includes a built-in thermoswitch, which is located in the center of the fan unit, and which turns the fans on and off automatically. The fan unit has a specially-constructed raised air-chamber base that enlarges the area of airflow, while also sealing air and preventing vibrations. This base covers 77 square inches. Please make sure that the top of your component has a flat area on top that is at least 11.25" x 7". Don't worry if your air vents are smaller (or larger) than the air-chamber base -- it is designed to adapt to any size vents. The system has a multi-speed power transformer, which plugs into an AC outlet. You control the speed of the fan, using this transformer, which can be set to any one of 5 different speeds. 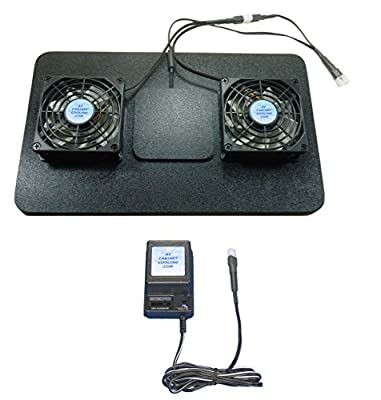 THE COOLING SYSTEM INCLUDES: 1 x dual-80mm Airchamber base with built-in thermoswitch module, 1 x multi-speed power transformer, and printed installation instructions. All cooling system parts connect together using special heavy-duty Molex quick-connect plugs, which allows the parts to be separated for easy wire-routing. SETUP: The system comes completely assembled, with all components installed, wired and ready to go! Just plug the power transformer into an AC outlet, and drop the fans and sensor on top of your receiver's top air vents. GUARANTEE: Your satisfaction is guaranteed. You can return the system for any reason within 30 days. 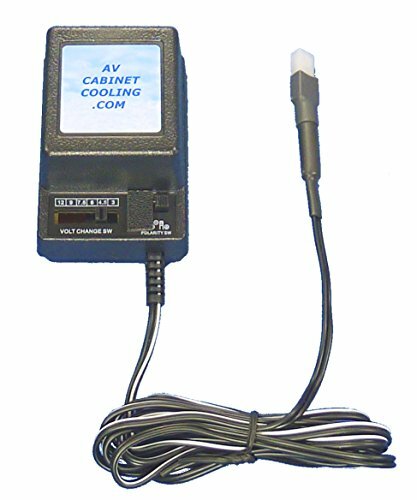 Since starting in 2005, AV Cabinet Cooling has sold over 10,000 cooling systems, and we are dedicated to great customer service. 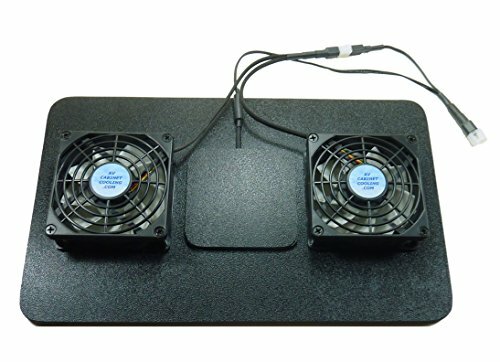 This dual-80mm fan unit is designed sit on your component's top air vents. It has a special raised air-chamber base, which covers over 80 square inches (11.5" x 7") of the vents. Air is pulled from your component over the full area of this raised air-chamber base. The system is controlled by a built-in thermoswitch, which turns the fans on and off at approximately 82F. You control the speed of the fans, with the multi-speed power controller. Even at medium speeds settings, the fans will replace a volume of air equal to that of most components several times per minute. 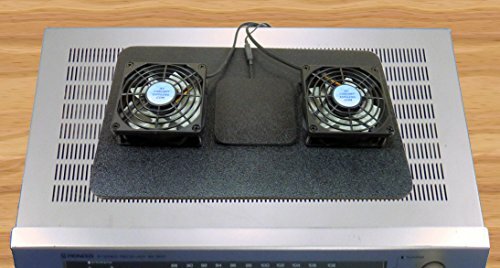 Recommended fan speeds for this system: The two fans (running together) are rated at 13db while moving 31 cubic feet of air per minute at 1/2 speed, or 16db & 41CFM at 2/3 speed. With component cooling, slow (and quiet) are the way to go! Other available speeds: 1/4 speed = 10db/16CFM, 3/4 speed = 19db/46CFM, full speed = 22db/62CFM. 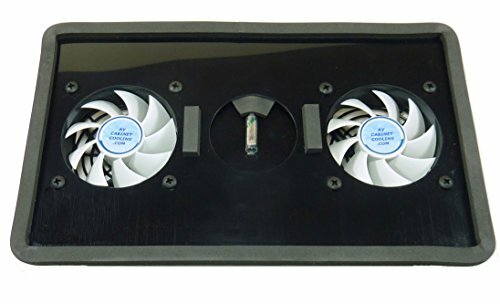 The Dual-80mm Airchamber base cooling unit measures 11" wide and 7" deep. It is 1-1/2" tall, and only requires about 1/4" of additional space for airflow.